HALBAN Each year, the Department of Urban Planning and Architectural Design (UPAD) at GUtech aims to give students the opportunity to realize a small building. 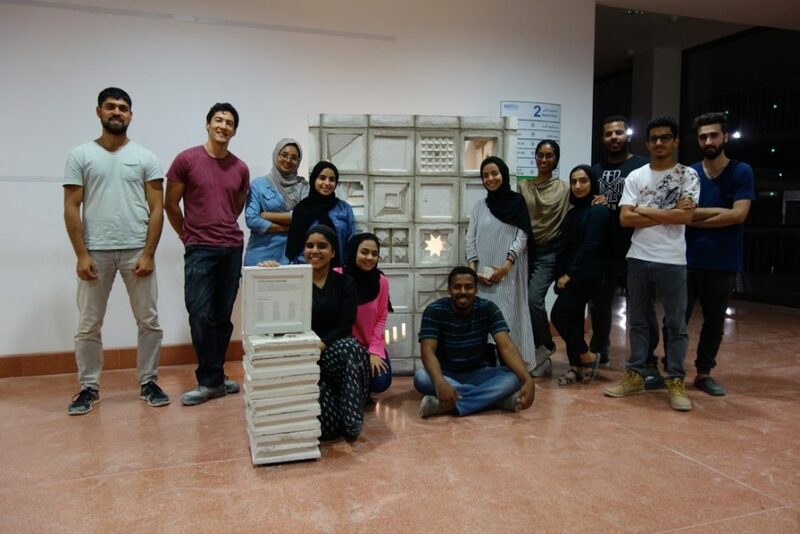 Last year students built a small tower from prefabricated rammed earthen blocks. “The goal is that they understand the construction in more depth and to see the consequences of their design. This year’s project by 2nd year students began with an investigation of local facades and the materiality of these shells – especially the ubiquitous cement block. The cement block has a mixed relationship with architecture: while practical and inexpensive, it is in most applications rather uninspired and monotonous,” said Wayne Switzer, Lecturer in the Department of Urban Planning and Architectural Design (UPAD) at GUtech. The students have challenged this idea by designing their own blocks, applying their understanding of form and relief to represent the cement block as a “Textile Block” – a permeable, versatile module worthy of a closer look. Students were responsible for the entire production and construction process – from making formworks, mixing cement, casting and then mortaring the modules, the students were involved. “This is quite unusual for architecture students in Oman. The process was done on campus in the small workshop beside the GUtech Eco-Haus. The free-standing sculpture that is now on display in front of the department exhibits the variety of forms developed by the students and also functions as a housing for a projector.” Said Wayne Switzer. Wayne Switzer is a Lecturer in the Department of Urban Planning and Architectural Design. Wayne brings firsthand knowledge in heading such projects, having led a number of international workshops focused on building with local materials. These workshops, often involving local communities provided him the valuable experience of how to implement innovative ideas through an understanding of local context. He previously held a teaching position at the Swiss Federal Technical Institute (ETH Zürich) where he specialised in contemporary earthen construction.